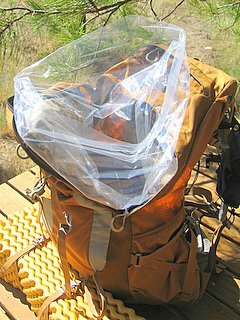 I always line my backpack with a plastic bag, even if it doesn’t look like it will rain, because I might slip into the water at a water crossing and a backpack liner can make the difference between my pack floating or it become dead weight in the water. White or clear are best; a black plastic garbage bag makes it hard to see the contents. I usually use a pack liner from Gossamer gear. They weigh 1.2 ounces. One will last a whole thru-hike but sometimes I have to add some duct tape patches to it. I never use a stuff sack for my sleeping bag, I just stuff it into the pack liner. It’s faster, doesn’t compress it so tightly, and I can fill up every inch of the bottom of my backpack.